There is no statue, idol or image of Devi in the temple, but in the corner of the cave in the temple, there is sculptured image of the yoni of the goddess, which is the object of worship. The natural divine atmosphere around the temple keeps the stone image moist. 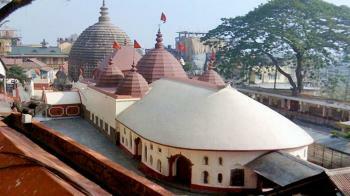 The kamakhya Devi temple is a temple complex of individual temples of all ten Mahavidyas. The timing of the temple is from 5:30 AM to 9:00 PM in all days of week. The best time to reach in this temple is from July to February. Devotees can also come any month in this temple throughout the year. In Summer : The temperature in summer is 22 degree Celsius to 40 degree Celsius. In Winter : The temperature in the winter is 5 degree Celsius to 26 degree Celsius. By Air : Lokpriya Gopinath Bordoloi International Airport is the nearest airport. This airport is located in Guwahati. The distance of this airport is 20 km from Kamakhya Temple. By Rail : Guwahati railway station is the nearest railway station. The distance of this railway station is 8 km from Kamakhya Temple. By Road : Kamakhya Temple is well-connected to all major cities.